Hello friends just a quick little post while on the road home from skipsea, it's ok I,m not driving.i have never seen so much rain this week and the drive home I thought car window was going to come threw. 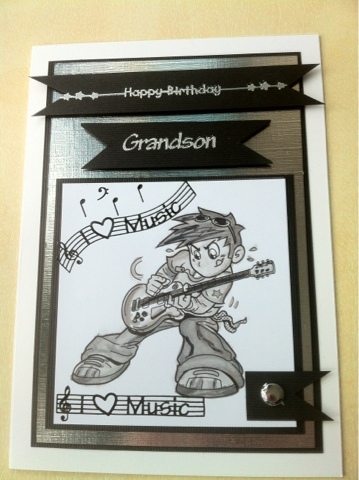 Any way here is a card I got asked to make for a grandson who plays guitar . 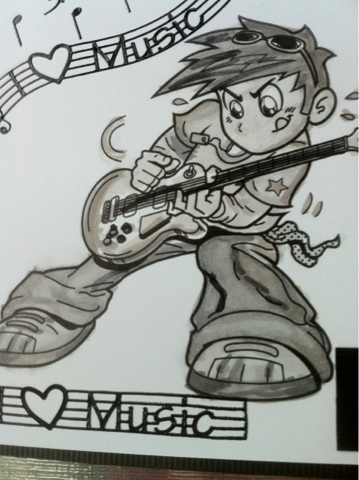 This is super Lyn - love that image and -as usual - your colouring is superb!! Colouring and image are fab. Loving Kenny K myself at the moment. Brilliant card Lyn, I like the image and the monochrome. What a fun card! I am loving the grey tones, and am sure the recipient will love this too! wow lyn that's fab. Love the kenny k's makes a change not to see them in really bright colours . It's gorgeous one lucky boy who gets that. Lovely card, have seen so many of these Digi's thsat I'm def buying a few...such great designs. I love the design you used & the choice of colour goes so well. Fabtastic.